VPS is another one of those pesky digital acronyms that seems to slide into view whenever we talk about building an online presence. So what is VPS and how can it benefit your business? When you build a website you need somewhere to host it. Hosting, as a product, provides you with a place to store all the files and data related to your website. Websites are stored (or hosted) on servers, which allow the public access when users enter the corresponding URL. Shared hosting means that you share a server with numerous other websites. If your site is hosted on a server with too many other websites, your site speed may be compromised. Likewise, if your site is hosted on the same server as another that doesn’t employ the same level of security, your site may also be at risk. VPS stands for Virtual Private Server and, when it comes to VPS hosting, instead of allocating shared resources across dozens of accounts, all the resources are dedicated to one account. Take renting a home as an example. Standard shared hosting is like renting an apartment. You receive a small place to store your things in a much larger building, that shares resources in the way of body corporate. VPS hosting, on the other hand, is like renting a house – the whole property is yours to use as you wish. Are there different types of VPS hosting? Yes. There are two types of VPS hosting, depending on how hands-on you wish to be. Managed VPS Hosting includes the installation and management of server and server applications. 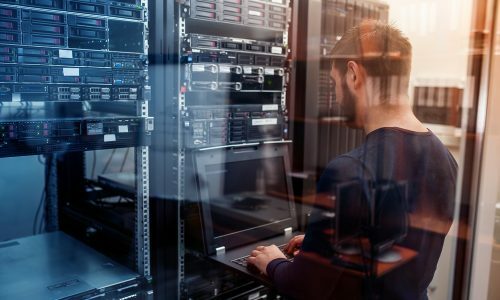 This is the ideal option for those who don’t have the intricate know-how to operate a server on their own, or the collateral to employ someone to do so. Unmanaged or Self-Managed VPS Hosting doesn’t include anything further than switching your server on. From there, you will need to source your own admin resource to manage the server and applications. This is the option you may like to take if you have an in-house IT team. When tossing up between shared and VPS hosting, it’s important to understand what you’re in for. Take a look at the benefits of VPS hosting. When you purchase VPS hosting, you control the activities that take place on your server. This means that there is no need to worry about your site or hosting being compromised by corrupt or illegal activities occurring on other sites hosted on the same server. As you don’t have to share your resources with other websites on a VPS, your site will perform faster as a result. This also has an impact on your digital marketing efforts, like Search Engine Optimisation (SEO). With your own Virtual Private Server, you have access to more storage space, CPU and RAM. Not only will this improve performance, it enables you to host multiple websites on the same hosting service. With VPS hosting, you have the flexibility to decide the operating system that runs on your server and the software you’d prefer to install. Finally, with the freedom of controlling your server and the increased space available, you can backup the files hosted at any time. To improve functionality and performance, get your website hosted on your own Virtual Private Server. Chat to one of our Online Solutions Advisors today to get started.